we are the distributors & Stockists of Hindalco Industries Ltd for their Everlast Brand Aluminium Roofing Sheets. The Everlast brand Aluminium roofing sheets are approved and used by a wide span of Govt., Semi-Govt., and private sector entities like Railways, Ports, PWD, CPWD, and so on. The Everlast brand sheets are absolutely non-corrosive and have a life span of 40-50 years under normal circumstances. It is even recommended in extreme conditions like chemically charged atmosphere wherein highly corrosive acids like sulphur, Hydrochloric acid etc are at play. For details please contact us back. 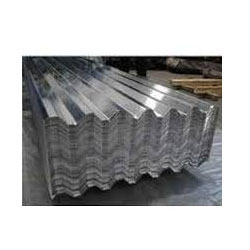 Plaso India is the reputed and well known name in the industry for supplying and trading a huge array of Metal Roofing Sheet, Bayer Makrolon Polycarbonate Roofing Sheet, PVC Roofing Sheet, PVC Bio Stretched Roofing Sheet and Roofing Accessory. We are basically sole proprietorship based company that has emerged in the year 1998 at Kolkata in West Bengal, India. Our entire range of product is weather proof, sturdily constructed, excellent performance, highly reliable, effective to use and premium in quality. These products are rendered to us by the leading manufacturers of the industry according to our demands and requirements with following the industrial quality standards in it. On the other hand, they are certified companies and they use high grade material in the manufacturing of these products.